The General Dynamics (now Lockheed Martin) F-16 Fighting Falcon is a multirole fighter aircraft originally developed by General Dynamics for the United States Air Force (USAF). THE FMS molded foam construction shows lots of detail and a very smooth painted matte finish. Total assembly time is about one hour due to the low parts count and beautiful fit. The 70mm fan unit includes an OUTRUNNER motor that provides lots of thrust for quick takeoffs with a strong climb out. Access to the 70mm fan unit and 70A ESC is also very simple: just remove 2 screws and the entire middle section of the main duct can be removed. This is great for those who want to hop this one up or simply need easy access for maintenance and blade balancing. The ducting is very clean giving the F-16 impressive speed, but in a model large enough for easy flight orientation. 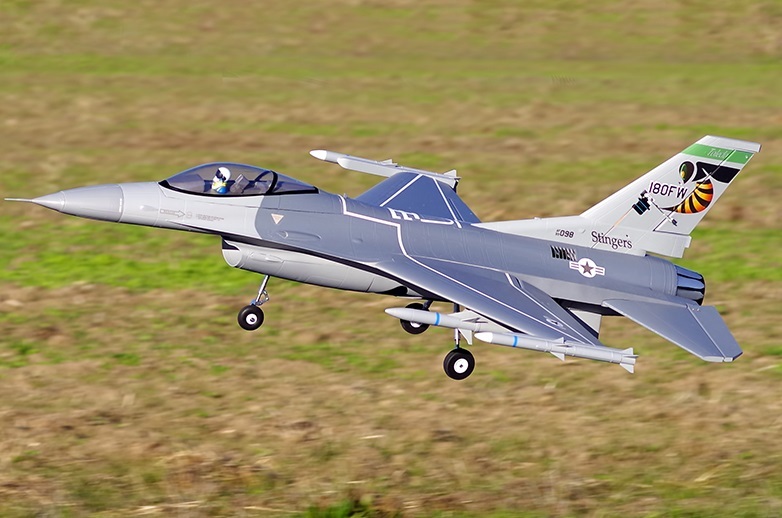 Landings are quite slow due to the large lifting body shape of the F-16. Bring it in with the nose high and it will slow to a walk.